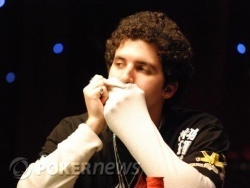 Edward Sabat came to our attention early on day one with his entertaining play and friendly demeanor, and he would remain prominent in the chip count page until the final cards were dealt. Sabat will look back at his tournament and the defining moment which came late on day three where he eliminated two players in one hand with his pocket aces to storm to the top of the leaderboard. He entered today's final table with the second most chips and wasn't afraid to mix up his play. Some unique betting lines meant he was always unpredictable and dangerous to his opposition. At one point Sabat was on the short stack but fought his way back into contention and never looked back. He was prepared to be aggressive and happy to gamble, right up until the very end when he called off with a flush draw which landed on the river to deliver him the coveted trophy and first place prize of $453,851. Congratulations to Edward and to all of our final table participants. 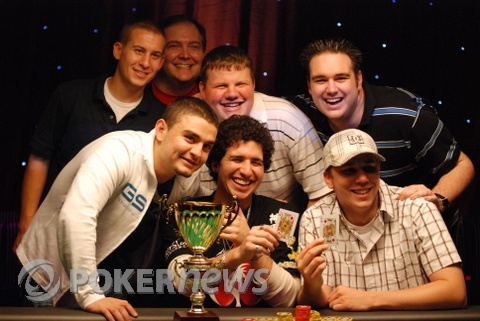 After 12 hours of play that wraps up our coverage of the 2008 APPT Macau Main Event. However we won't be exiting the Grand Waldo Hotel and Casino just yet. We'll be back again tomorrow for the start of the highly aniticipated APPT Macau High Rollers event where the world's biggest stars will come together to battle for a huge prize pool. All the action kicks off at 1:30 p.m. tomorrow and we look forward to you joining us once again at PokerNews.com! The Chuck Truck finally broke down. 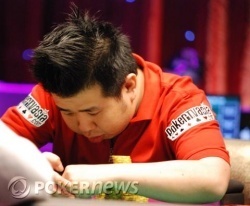 Charles Chua had first action and opened the pot for 150,000. Edward Sabat made the call. Fireworks commenced on a flop of . Sabat opened with a check, leading Chua to bet 275,000. Sabat then check-raised to 550,000, but Chua wasn't fazed. He reraised all in. Sabat leaned back in his chair and scrunched up his face, trying to puzzle out what Chua might have. Chua looked nonplussed, taking a couple of swigs from a bottle of Coke and looking around. The talking began after that with Sabat asking Chua "Do you have a queen?" They engaged in some back-and-forth, but from media row it was difficult to make out everything that was said. Either Sabat liked what he heard or he decided to gamble, because at the end of the conversation he made the call. Chua was the all-in player, but he had the best hand with two pair, queens and sixes. Sabat was drawing quite live with an overcard and a flush draw. The turn gave him even more outs, bringing a gutshot straight draw into play. With a dramatic pause, the dealer burned and turned the on the river to fill Sabat's flush and send Chua to the rail to collect $291,761 for his impressive second place finish. 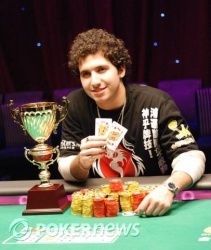 With Chua's elimination, Edward Sabat has been crowned the champion of the 2008 APPT Macau Main Event! Edward Sabat opened with a raise to 150,000 from the button and Charles Chua made the call. We saw a flop of and both players checked. The turn was the and again both checked. The river landed the . Chua checked and Sabat took it down with a bet of 225,000. Charles Chua completed from the button and Edward Sabat checked his option in the big blind. They took a flop of . Sabat checked and Chua fired out 100,000. Sabat folded and Chua makes it two in a row. The Chuck Truck isn't out of luck yet. Charles Chua checked the big blind after Edward Sabat completed on the button. The flop came down all ragged, . Chua checked to Sabat, who bet 100,000. Chua quickly called. The turn brought a second heart to the board, the . Chua checked a second time, bringing a bet of 300,000 from Sabat. After about twenty seconds of thought, Chua moved all in and for the second time, Sabat snap-called. Sabat again showed top pair. For his part, Chua opened bottom pair with an overcard and a flush draw. The shouting in the gallery began, with each faction calling out for cards that would make their respective horse the winner. With Sabat standing over the table and Chua sitting down, the dealer delivered the final card of the board. It was the , making trip deuces for Chua and doubling him up. We're back to where we started. Charles Chua completed from the button and Edward Sabat checked his option in the big blind. They took a flop of . Sabat checked and Chua fired 75,000. Sabat then check-raised to 300,000. Chua quickly folded and Sabat takes another heads-up pot. In our first raised pot of heads-up play that went to the flop, Edward Sabat made it 175,000 to go and Charles Chua called. Chua, as first to act after the flop , checked to Sabat. He made it 255,000. Chua moved all in and Sabat snap-called. Chua had Sabat covered but was trailing in the hand, opening just a gutshot straight draw against Sabat's top-top. Chua didn't improve at all with the turn. There was a dramatic pause before the dealer burned and turned the river. It was the , a card that did not improve Chua's hand. Sabat now has a roughly four-to-one chip lead over Chua. The first few pots of heads-up play have been "raise and take it" affairs. 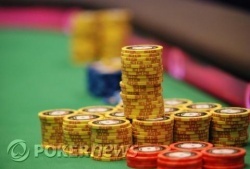 Both players have exchanged pots with raises from the button to 150,000 being good to take down the blinds and antes. The cards are now back in the air!